Tiles have long been the wall and floor covering of choice when it comes to the bathroom. And there’s a good reason for this. They are hygienic, easy to clean and very pleasing on the eye. If they were good enough for the Romans, then they are certainly good enough for us. What’s more, tiling, when done well, can add value to your home, so it’s important to get the job done correctly. If you’re thinking of having a go yourself, here are the top 4 things to take into consideration. A budget is one of the first things you'll need to decide upon before buying your tiles. If you are on a tight budget, ceramic tiles are a good choice, as they are affordable, durable, and look lovely when installed correctly. If you have a little more cash to splash, natural tiles may be the ones for you. They're long lasting and will transform your bathroom into a luxurious haven. Use a tile calculator (which can be found on any tile page) to work out how many tiles you'll need – ensuring that you have included an extra 10%, to make up for any tiles you may chip or break (known as “wastage”). How big should my tiles be? The size of the tiles you'll need will be largely determined by the size of your bathroom space - a larger surface area is easier to tile with larger tiles. However, there are no hard and fast rules and with a little imagination and creativity, you can successfully decorate a small bathroom with large tiles and get a beautiful and very elegant result. Large tiles can look quite dramatic and striking in smaller bathrooms. This is because larger tiles equal less cuts, giving a cleaner, professional look. However, smaller metro tiles (based on a style of tile you might find in London Underground stations) are becoming ever-more fashionable, but due to their smaller size, they will add time and effort onto your project. Before installing your tiles, be sure to measure them, as sizes can vary slightly. How should I prepare for tiling? So you've chosen your tiles and you're ready to transform your bathroom into a work of art. Before you begin the installation process, you need to make sure you waterproof the walls surrounding your shower and bath. It’s fairly obvious, but these are the areas that will come into contact with water the most, so extra precautions are needed. This procedure is quite simple and there are lots of waterproofing kits available and wall matting products, designed to make this a relatively simple task. Decide where your fixtures, fittings, ledges and frames will go on your walls. Once you are sure, highlight the areas with a marker. This way, electricians, plumbers and other tradespeople you employ, will have an idea of the places they'll need to avoid when drilling holes for lines. Drawing out a plan for your tiles is also useful and once you begin tiling, do so from the top to the bottom. You'll get a more even and professional finish, free of superfluous, untidy cut tiles. Even modern bathrooms aren’t always uniform in size and shape. You may find the ceiling slopes slightly or one wall may be slightly different in surface area to another, so make sure you measure your bathroom accurately. How do I choose the right bathroom tiles for the job? 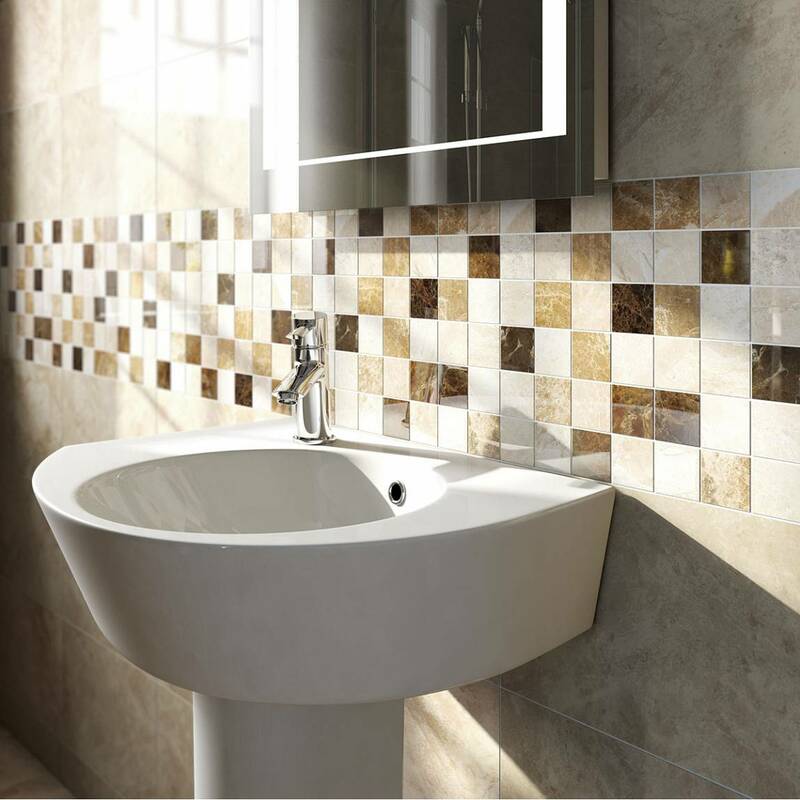 The type of bathroom tiles you select, will depend on your budget, theme and personal taste. You'll also need to think about the areas your tiles will be covering. For example, if you are planning to tile the floor, you'll need bathroom tiles that are durable, textured and marked as suitable for floors. These days, you will find an excellent range of specialist bathroom floor tiles, including glazed porcelain and travertine (a type of limestone) tiles, as well as ceramic designs. 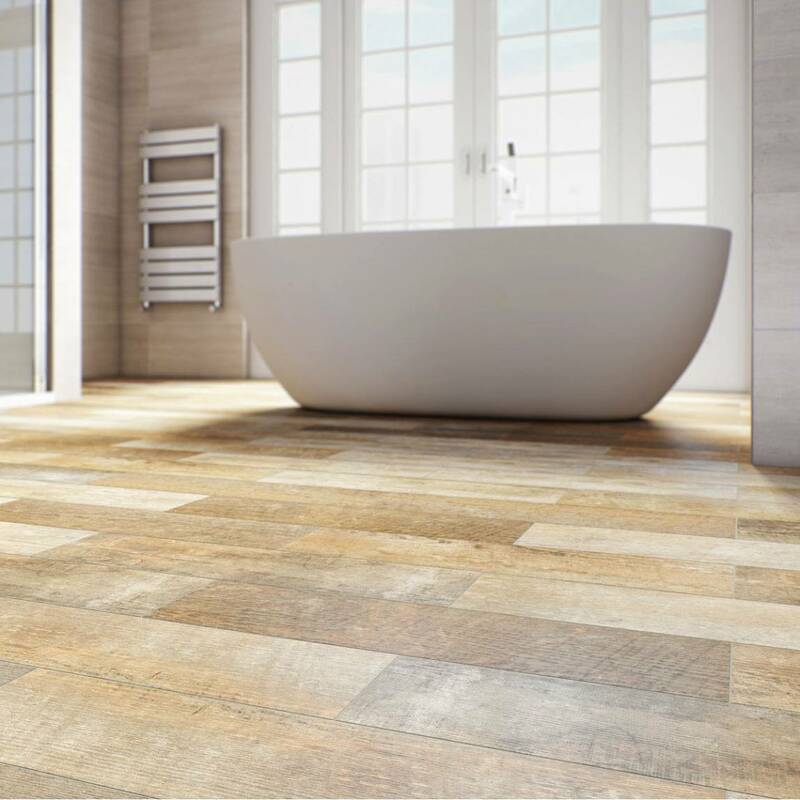 If you wish to be more adventurous, go for wood-effect tiles, giving your floor a distressed and aged look. If tiling over wood, your floors will feel pleasantly warm underfoot. If however you are tiling over cement flooring, it may be worth investing in underfloor heating. Porcelain bathroom wall tiles are perfect for shower spaces, ceramic tiles are hard-wearing and polished marble mosaic bathroom wall tiles are artistic, elegant and eye-catching. Like the look of wood, but don't want to deal with the maintenance? Why not try wood effect tiles instead? For more great tile ideas, check out our tiles inspiration gallery. Tiles are the foundations upon which many great bathrooms are built, so it’s vitally important you get this bit right. Here at VictoriaPlum.com we’re dedicated to helping you build the perfect bathroom, so here are our tips for bathroom tiles.